In December, PLJV finished a two-year playa restoration project, funded by the Wildlife Conservation Society’s Climate Adaptation Fund, that filled pits in 17 playas in four states. Of those, 14 playas are on US Forest Service National Grasslands: four on Kiowa National Grassland in New Mexico, nine on Comanche National Grassland in Colorado, and one on Rita Blanca National Grassland in Texas. 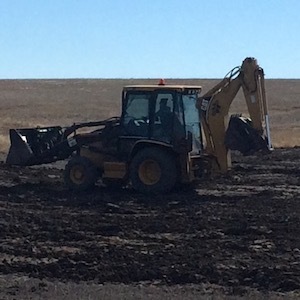 The other three playas include on private land in collaboration with USFWS Partners for Fish and Wildlife Program in Colorado, and two in collaboration with the Oklahoma Commissioners of the Land Office. Playas are biodiversity centers of the region, vital to Central Flyway waterfowl, shorebirds and waterbirds, and a primary source of recharge for the Ogallala aquifer, which provides water for the people who live and work in the western Great Plains. In the past, pits were often dug to help irrigate surrounding land or collect water for livestock. These modifications interrupt a playa’s natural hydrology and reduce its ability to provide food and habitat for birds and other wildlife. The modifications can also impact the quality of groundwater that recharges through playas. Since many of the pits and trenches are no longer needed, a playa can easily be restored by using the spoil pile from the original excavation, which is often present, to refill the pit or trench. This two-year playa restoration project was funded through a grant from the Wildlife Conservation Society’s Climate Adaptation Fund, which was established by a grant from the Doris Duke Charitable Foundation, and is part of a larger, long-term strategy to fill pits, trenches and other modifications in playas throughout the PLJV region.